Tracks 1-5 are the SKAN Demos – recorded live in March 1979. Tracks 6 & 7 are from the First Tape Album – recorded at Multium Studios, Wokingham in December 1979. A single CD pairing the ‘legendary’ SKAN Demos, the first ‘live’ recordings ‘TN’ ever made, with the first tracks the band recorded in a proper recording studio. This ‘first time on CD’ release includes specially written sleeve-notes, and some brand-new artwork from in-house design-wizard David Read (whose previous ‘TN’ credits include both the Play On and Reading Rock DVDs). The SKAN Demos were the first time we recorded ourselves playing, way back in March 1979, when there were only three of us in the band: Andy (Rev), Clive and me: (Guitar, Bass, and Drums respectively.) The recording took place in an empty hall at Reading University using equipment supplied by our favourite local PA company; SKAN PA Hire. The five tracks recorded that day include a version of Fur Helene I that is longer than Sequences, and Sequences itself, which features an over-dubbed guitar solo, the first time we had used this simple recording technique. The full-length cassette album, which we sold at gigs, comprised the two studio tracks (Freddie Hepburn and Sequences) and two tracks from our Reading University gig in November 1979 (Fur Helene 1 and Encore). While both studio tracks are included here, for reasons of space the live tracks are represented on this Archive Release CD by their earlier ‘keyboard-free’ SKAN versions. 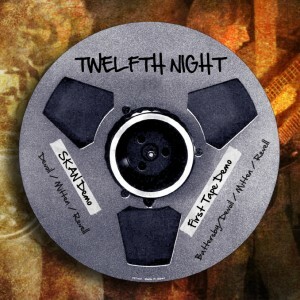 So if you want to hear how it all started for Twelfth Night… This is Act One: Scene One! Excerpts from Brian Devoil’s sleevenotes written in June 2013.